In 1980, fifth-generation Napa Valley resident Jerry Taylor, his wife, Pat, and their children—Scott, Sandy, and Mike—took on the ultimate do-it-yourself project: converting ten acres of the family’s 23-acre ranch in the Stags Leap District of Napa Valley to vineyard. This experience of the five family members, on their hands and knees planting and tending young vines, was a dream come true for Jerry, who had grown up on his family’s farm, and now was the family’s fifth generation of Napa Valley farmers. As the vineyard grew and matured, so did the family tending it. Sandy and her husband, Phil, were the driving force behind the creation of Taylor Family Vineyards as a wine brand, the inaugural vintage for which was 2002. This next venture was a way to honor the family’s deep roots in the Napa farming community while keeping an eye to its future: creating a legacy by transforming the fruits of their labor into fine wine. Danielle and Tyler were both teenagers when the winery was established, and because it was started on a shoestring budget, neither imagined it would grow to a point that it could support them as full-time employees. Both established their own careers in other industries in other parts of the country, but returned to the family property in 2014 to help with the growing demand of the winery and the declining health of their grandfather. Today, Taylor Family Vineyards remains family owned and three generations of the Taylor family operate the family business. They are its only employees, and not only do they work together, they learn together: all three generations have attained Level 1 sommelier certification. As a team, they grow grapes and make and sell the wines in the same way they try to live their lives: striving always for balance. The winery now produces 2,200 cases of wine per year, which is available only through the winery. A third-generation California resident, Pat met Jerry when he returned from serving in the Air Force during the Korean War. They married in 1955 and three children—Scott, Mike, and Sandy—followed. 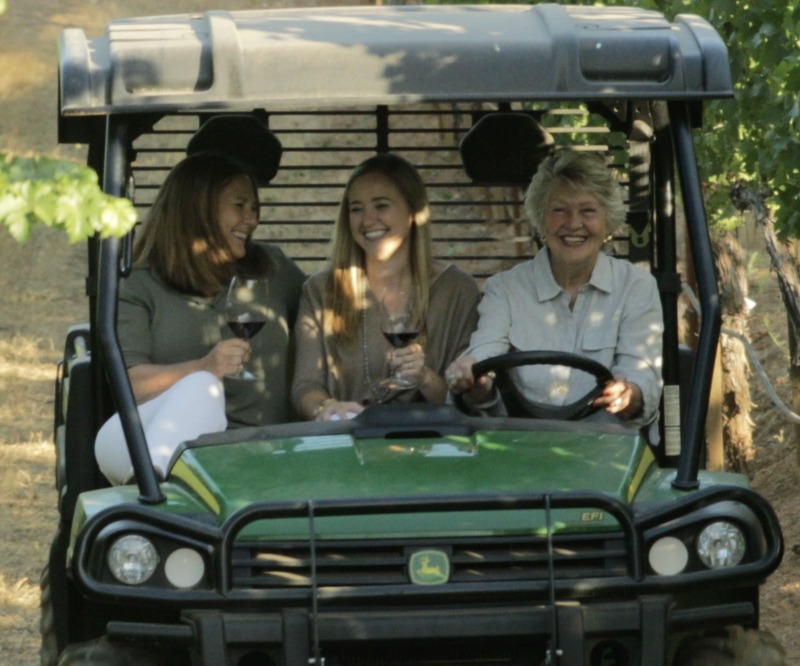 Pat enjoyed a successful career in real estate until retiring from it in 2011, but she has been hands-on involved in the vineyard and winery since the family purchased the ranch in 1976. Pat now hosts tastings with Danielle and maintains the gardens. Sandy’s wine career started with an “internship” in the family vineyard: planting, pruning and tying vines under the guidance of her father. After graduation from college, she worked as a controller for other Napa wineries, learning the business aspects of the wine industry. But ultimately, her love for the land drew her back to the family business, and she launched it into its next phase: producing wines under the Taylor Family Vineyards label. As president, Sandy oversees the daily operations of the winery, as well as the sales and marketing of the wines. Sandy is also the winery “palate,” responsible for ensuring each wine remains true to the family style, which includes managing the winery’s close relationships with its growers and helping determine final wine blends. Phil Carlson is a Naval Academy graduate and former commercial airline pilot, and his time in the air funded the take-off of his and Sandy’s dream of launching a family wine label. He began his wine career as an apprentice to Jerry in the vineyard, then moved on to apprentice in the cellar to consulting winemaker Gustavo Brambila. Phil retired from flying planes commercially in 2012 to focus on the winery, where he is both “chief pilot” and cellar crew. Mike grew up in the vineyard, working alongside Jerry. His early days were spent removing rocks from the vineyard and tying vines, but he soon advanced to tractor driving (“I was driving tractors as soon as I could reach the pedals,” he admits), pruning, and suckering. To complement this hands-on education from his youth, Mike worked for both a vineyard management company and a winery before returning to Taylor Family Vineyards in 2014. He now hosts tastings and oversees the day-to-day vineyard operations, the steward of the lands and vines that he grew up with. Danielle obtained Bachelor degrees in Accounting and Finance and a Masters in Accounting before joining the financial sector, first with Ernst and Young in Fort Worth, and then Stephens, Inc. in Little Rock, AR. She returned to Napa Valley and the family business in 2014, and while she does put her background to work helping with finance decisions with Sandy, Danielle has embraced the people oriented/creative aspect of the business. She serves as brand manager and ambassador, responsible for all aspects of marketing, club membership and customer service—from hosting tastings with her grandmother and developing the winery’s marketing materials to preparing wine club orders for shipment. She currently sits on the Board for the Stags Leap Winegrowers Association and is working on her Level III WSET sommelier certification. After graduating from Universal Technical Institute with specialization in Automotive and Volkswagen, Tyler spent 10 years working for specialty shops in AZ and northern CA before joining the winery in 2014. With his mind for everything mechanical and his affinity for problem solving, Tyler has the ability to see what’s needed, whether in the vineyard or cellar or across the estate, and find the way to fill that need. So in addition to working in the vineyard and the cellar, he maintains the “fleet” of tractors, equipment and vehicles, and keeps the property running smoothly (“He makes improvements we didn’t know we needed until he did them” his sister admits). Beyond repairing and maintaining he also has a knack for improving processes: he taught himself the art of how to perfectly wax seal wine bottles—a skill requiring finesse and patience to master—then taught the rest of the family his technique to achieve the same results.